Our spacious family house is peacefully situated near the village center. Shops, restaurants, swimming pool, lakes, golf, horse riding and many other activities are within walking distance. Seefeld situated in the Tirol, lies on a plateau 1200 m. Above sea level surrounded by lovely mountain scenery. The German border is 10 km away and the Brenner Pass into Italy just 50 km. Seefeld is easily accessible by either car or train. The nearest airports are - Innsbruck 20 km. Munich 130 km and Salzburg 200 km. Golf, tennis: The 18-hole championship course is situated in the splendid scenery of the natural preserve of Wildmoos. The Golf academy in the village center is ideal for beginners or players who want to improve their handicap. From golf to tennis, or riding a horse - sports for which Seefeld has ample amenities: 8 indoor and 20 outdoor tennis courts and two riding stables. Walking: We can satisfy your wishes for long mountain and walking tours with over 250 km of walking trails. And also your wishes for: climbing, rafting, mountain biking, para gliding. Three lakes to bathe in, an adventure landscaped swimming pool, cable-cars and chair-lifts which take you up the comfortable way to where there are breathtaking views, and numerous indoor facilities round off the wide range of leisure activities. All bedrooms are upstairs. Bakery service - we can provide for fresh bread and rolls which can be booked upon arrival. Children - please ask for a cot and high chair if required. Washing service - we can have your washing done for you. Guests with children can also take advantage of a children’s program and kinder garden. Great house and location. We loved eveything! Haus Alice was the perfect base for our Skiing holiday. The accommodation was spotlessly clean and well equipped for all our needs. Alice was fantastic to deal with throughout the booking process and during our stay. Our extended Aussie family rented the entire house for a white xmas in 2013. Everything from beginning to end was fantastic. The price of the chalet was significantly less than most other places we contacted. The chalet was very nicely furnished with everything you could possibly need. Most bedrooms have their own ensuite, the beds were comfortable and the house impeccably clean. Alice the owner, was fantastic throughout the booking process answering all of our questions and even pre-ordering a large turkey on request and organising a fresh decorated Xmas tree to be in the house when we arrived. The house had also been set up with xmas decorations in each room. The location of the house was perfect for us. Only a 5 minute walk to the beginner slopes, and only a few minutes extra for the main part of Seefeld. It was however just far enough out of town though to be exceptionally quiet. I am a very sensitive sleeper and not once did I hear any external noise at night. The centre of town was very busy with traffic on many nights and we were glad to be staying where we were. The only slight negative that I can think of would be that the wireless internet is quite patchy in the house. Some areas had no coverage while others were great. If this could be improved with a stronger or more suitably located router, I would say that the house was absolutely perfect. Overall though we all loved Haus Alice, and would like to thank Alice for organising such a pleasant stay for us. We loved our stay at House Alice this August (2010). The house was very spacious and well accessorized with everything we needed, the rooms were spacious and clean and the trampoline and bicycles were a hit with the kids. The owners were very helpful and responsive. The house is a shorty walk to the town center which is very beautiful. Seefeld is one of the loveliest towns we have seen during our stay in Austria. We highly recommend it to other families! We rented this house for 9 people in the Summer. All the rooms were very nicel;y decorated and were of a good size, many with en suite bathrooms but not all. The living room was not huge, but big enough, and the Stube was cosy- again not huge but pleasant. The kitchen and eating area were very nicely done with all appliances present and working. Overall the house was exactly what we expected, and perhaps a little better - value for money was superb given that there were 9 in our party. The location was very good. 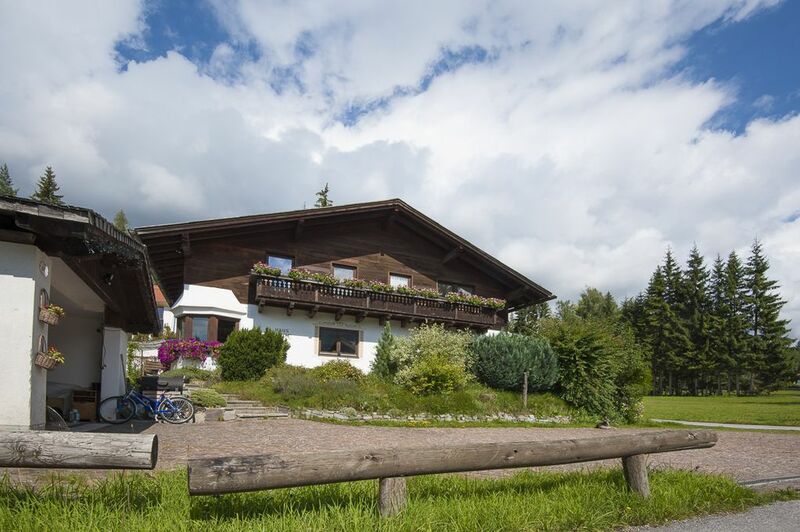 Easy to walk into Seefeld either along the roads or the pathways, no driving required! This meant we could go out in the evenings and not worry about having a glass of wine or two. Bicycles were provided but were a bit rickety and only really good for a short trip into town. Overall this holiday was very good indeed and I would have no complaints at all about the house - the owners were very helpful also, in fact they had specifically gone and obtained english leaflets for us for the week. I would certainly go back again for another week!